This piece was authored by The Daily Signal, and its content solely reflects the published views of The Daily Signal and its journalists. Israeli Prime Minister Benjamin Netanyahu on Monday praised President Donald Trump as the greatest friend Israel has ever had in the Oval Office. 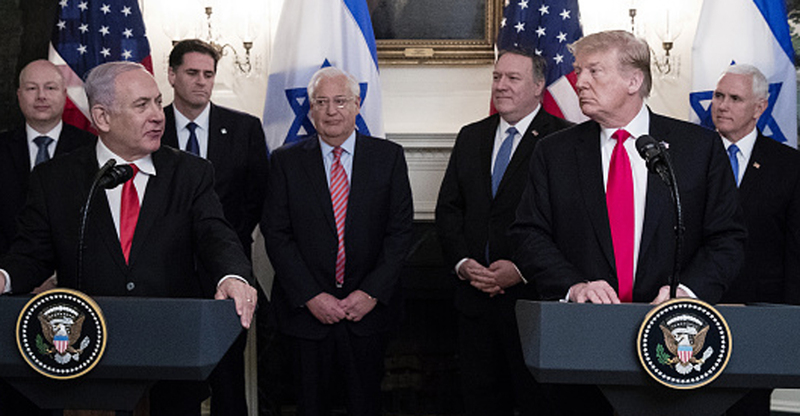 Netanyahu’s comments at the White House came moments before the president signed a proclamation for the United States to recognize Israel’s sovereignty over the Golan Heights, territory seized from Syria in a 1967 war. “Israel has been blessed to have many friends who sat in the Oval Office, but Israel has never had a better friend than you. You showed us time and again,” Netanyahu told Trump. The prime minister noted that Trump pulled the U.S. out of the Iran nuclear deal that the Obama administration had entered into, that Trump moved the U.S. Embassy in Israel to Jerusalem, and is now moving to recognize Israel’s claim to the Golan Heights, a strategic point to fend off enemy attacks. “You’ve showed it once again, Mr. President, with your official proclamation recognizing Israel’s sovereignty over the Golan Heights,” said Netanyahu, standing next to Trump. Netanyahu was set to return to Israel immediately after the visit, in a U.S. trip that was cut short because of a rocket attack from Gaza that damaged a home north of Tel Aviv, wounding seven people, including two small children. The Israeli prime minister was scheduled to speak Tuesday to the American Israel Public Affairs Committee and then meet with congressional leaders. The visit between the two leaders also comes at an unusual time regarding legal issues both have faced. While the Justice Department announced that Trump had been cleared in a two-year special prosecutor’s investigation into whether his campaign conspired with Russians in the 2016 presidential election, Netanyahu faces the specter of an indictment for an alleged bribery scandal. “Our relationship is powerful,” Trump said. “Today, Israel demonstrates the incredible possibilities when strong, sovereign, and independent nations chart their own destinies. There can be no better example of greatness than what Israel has done, starting from such a small speck of sand. “Israel is an inspiration, a trusted ally, and a cherished friend,” he said. The post Trump Recognizes Israel’s Right to Golan Heights During Netanyahu Visit appeared first on The Daily Signal.